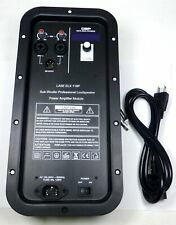 Crown Pro XLS1002 XLS 1002 700 Watt DJ/PA Power Amplifier Amp, Only 8 LBS + DSP! Up for sale are Carver PM2.0t power amplifiers. These amps are fully tested and in good working order. These amplifiers were used on tour by a major sound company. The amplifiers do you show some signs of use and wear but are overall in good condition. If you are interested in multiple of these amplifiers, I am offering an entire rack with 12 amplifiers in another auction. I also have the mono block version of this amplifier as well. Please check out my other auctions for details. Item Code: PX3000. 3000 watts peak power. Power, Level & Clipping indicators per channel Frequency Response: 20hz-20KHz. Authorized Technical Pro Dealer! If the item you chose is more or less money we will work out the price difference with you. 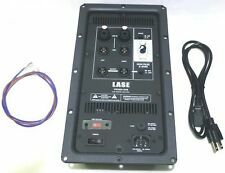 (If You Have An Old Blown Mackie SRM-450 Amplifier Module Replace It With LASE (Complete New Design) Very Easy To Install) Works From 110V to 240V. Input Connectors (per channel) : 3-pin XLR, 1/4" phono, electronically balanced. Unprecedented power density,2 channel power amplifier. Class D wiring amplifier. Channel separation : (Crosstalk) at 1 kHz >70 dB. In/Out Phase switch 0 - 180 . Efficient cooling system,100% pure copper heat sink. Works 110V or 220V. Channel separation: (Crosstalk) at 1 kHz >70 dB. Input Connectors (per channel) : 3-pin XLR, 1/4" phono, electronically balanced. Output Power: 20-20kHz, 1W with 1 khz. Power Output RMS : 500 W RMS, 1000 W peak (overall). Channel separation: (Crosstalk) at 1 kHz >70 dB. Input Connectors (per channel) : 3-pin XLR, 1/4" phono, electronically balanced. Output Power: 20-20kHz, 1W with 1 khz. Power Output RMS : 5 00 W RMS, 900 W peak (overall). Behringer NX4-6000 Specs. The NX4-6000 features cool-running, high-density Class-D technology with near-zero thermal buildup, and an independent DC, LF, and thermal overload protection on each channel, which together protect the amplifier from shutting down and interrupting your show. Stetsom EX3000 EQ – 1 OHM - Mono High Power Car Audio Amplifier 3,550 w RMS at 14.4 VDC- Authorized Stetsom Dealer. 1 x Stetsom Amp EX3000EQ at 1 Ohm. RMS Power at 1 Ohm 12.6V 3000W RMS. RMS Power at 2 Ohm 12.6V 2100W RMS. Power output level Stereo 8 ohms 350W 350 W (2700) Stereo 4 ohms 500 W 500 W (P2700) (except Canadian model) Mono 8 ohms 1000 W (P2700) (except Canadian model). Channel separation (Input level minimum) 175W (P2700) 1kHz @ 8 ohms. No Alaska, Hawaii, PR, or Canada. Tested and Everything is working. Tested, passes audio well, fan is very noisy when first powered up. Processing Information. By purchasing from us, you are taking part in helping this marketplace flourish. Scuffs, dings and dirt. As a power amplifier, the MM2000BT sports a whopping peak output of up to 2000 Watts. In addition, the MM2000BT boasts 355 RMS watts per channel to ensure connected speakers consistently pump out vibrant, full-bodied sound. This product has been tested and is fully functional. Overall in good condition. Processing Information. By purchasing from us, you are taking part in helping this marketplace flourish. Wav files onto USB Flash Drive or SD Card from Tuner & RCA inputs. FM manual tuner. Repeat / Random playback on USB / SD Card inputs. Inputs: RCA (2 audio sources), USB, SD Card, MP3 (AUX). USB & SD Card maximum size: 32GB. No Alaska, Hawaii, PR, or Canada. Check ALL Photos. Seismic Audio's line of Plate Amplifiers gives you the ability to build your own powered speaker cabinets and powered subwoofer cabinets. The SA-APBM12 is a Class AB amplifier designed for full range PA speaker enclosures. Seismic Audio's line of Plate Amplifiers gives you the ability to build your own powered speaker cabinets and powered subwoofer cabinets. The SA-APT002 is a Class AB amplifier designed for loudspeaker enclosures. Four-channel wireless receiver with four channel outputs and one MIX output via XLR connector. CROWN MACRO-TECH MA5000VZ amplifier. They areheavy. Filter foam included. The LASE VRX 600-AB 600W Bi-Amp Power Amplifier is a high performance switching power amplifier. Unprecedented power density,2 channel power amplifier. Class D wiring amplifier. Channel separation : (Crosstalk) at 1 kHz >70 dB. Carver PMx250 Power Amplifier. Condition is Used. Shipped with USP. Used in a church, works fine. Made in USA. 2 x 125 at 4 ohms. Bridgeable. No rack ears.. Positive 78 594 1180. Negative 0 1 2. Item as described. Great price. Item as described. ) During past month. kcl5trades ( 463. abcvkids ( 400. ). Now you can run your stereo full range mains plus two separate monitor mixes with this one exceptionally lightweight, rack-mountable powerhouse. The highly versatile iNUKE NU4-6000 gives you options, and lots of them. QSC GX5 2-Channel 700W Per Channel PA Power Amplifier. Condition is Used. Shipped with USPS Priority Mail. The Crown XLS 402 Power Amplifier has plenty of headroom. 2 x 700 watts into 2 ohms/1,400 watts into 4 ohms bridged operation. No Power Cable Included, but it takes a standard IEC 'computer type' power cable. We cleaned and tested the amp. Color:silverMaterial: metalVoltage:12VSize:11CM x 6CM x 3 CM/4.3" x 2.4" x 1.2"4-channel stereo headphone amplifier HA4004-channel stereo headphone amplifier for all types of headphones4 high-power stereo amplifierBest sound quality can be obtained even in a high volume levelsEach channel has output levelUltra low-noise 4580 operational amplifiers ensure superior toneHigh-quality components and exceptionally rugged construction ensure long lifeUltra-compact headphone amplifier system for studio and stage applicationsPackage Contents:1 x Headphone Amplifier1 X US plugNote: Light shooting and different displays may cause the color of the item in the picture a little different from the real thing. The measurement allowed error is /- 1-3cm. Brand Unbranded MPN D.
Stetsom STX2448 Crossover & Equalizer - 4 Way Audio Processor. - The STX2448 has 2 Inputs with equalizer and independent gain. Graphic Equalizer 15 Bandas (Band). Graphic Equalizer presets 15. Use this crossover to protect your mids and high from low damaging bass, resulting in high power handling and SPL! Eminence speaker in good working condition. Crown XTi 4000 2-Channel Power Amplifier. Condition is Used. Shipped with USPS Parcel Select Ground. Crown XLS 202 Electronically balanced XLR Inputs Power Amplifier. Condition is Used. Shipped with USPS Parcel Select Ground. Gain knobs on front missing, but the gains work / Amplifier in good condition. Mode select switch for stereo or bridged. 900W @ 8 ohms. Item Code: LZ10K. LCD Display Indicating Level, Clip, Protection & Temperature of Both Channel Built-in key lock (cuts audio output to prevent tampering). Built-in key lock (cuts audio output to prevent tampering). Crown CTS 1200. Condition is Used. Shipped with USPS Parcel Select Ground. Some minor scratches. Performance is fine. Shipping outside of the continental US will be higher. Condition is Used. Power output: 400 watts per channel into 8Ω (stereo), 1320W into 8Ω (mono). Speaker load impedance: 2Ω to 16Ω. Signal to noise ratio: 105dB. Carver PM-120 Magnetic Field Power Amplifier Amp, fully tested. Our LE Series amplifiers are designed for the professional DJ & entertainers that need quality power, but have a limited budget. Every LE Series amplifier provides excellent performance for all speakers. Stetsom EX3000 EQ – 2 OHMS - Mono High Power Car Audio Amplifier 3,600 w RMS at 14.4 VDC - Authorized Stetsom Dealer. 1 x Stetsom Amp EX3000 EQ at 2 OHMS. RMS Power at 2 Ohm 12.6V 3000W RMS. RMS Power at 4 Ohm 12.6V 2100W RMS. CROWN MACRO-TECH 24x6 AMP AMPLIFIER MACROTECH MA24x6 VERY NICE BUY IT NOW!